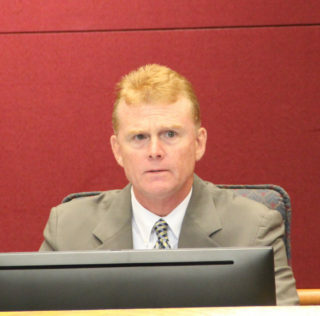 With a unanimous vote on Feb. 26, the Sarasota County Commission formally approved a contract making Deputy Sarasota County Attorney Frederick J. 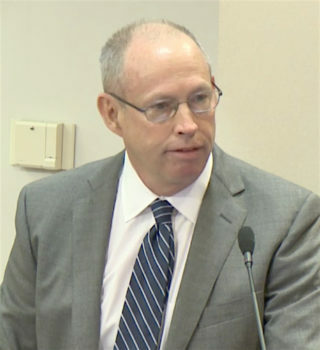 “Rick” Elbrecht the new county attorney, effective as of “12 a.m. on April 1, 2019,” as the contract says. As Chair Charles Hines had pointed out in a Feb. 21 email to his colleagues, he wanted to allow them an opportunity to ask any questions about the terms, even though they voted 5-0 on Jan. 29 to direct Hines to negotiate with Elbrecht for the latter to serve as the successor to County Attorney Stephen DeMarsh. “The number’s not out of the blue,” Hines told his colleagues during their regular meeting on Feb. 26. It is comparable to the salaries of other county attorneys with backgrounds and experience similar to Elbrecht’s, Hines added. 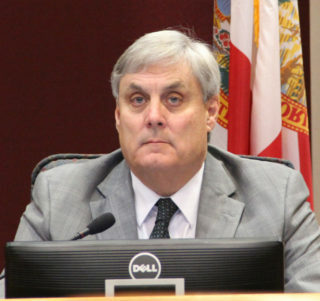 Prior to the commission’s approval of a 3% raise for DeMarsh last year, based on DeMarsh’s October 2018 evaluation, DeMarsh’s salary was $237,681.60, county Media Relations Officer Ashley Lusby told The Sarasota News Leader. Hines also explained on Feb. 26 that in the process of drawing up the contract, he and Elbrecht had worked to clean up language that no longer seemed necessary. The contract says the board may terminate the county attorney with or without cause if four of the members approve the decision on a vote. Otherwise, a majority of three would be necessary in two separate votes conducted during official meetings three weeks apart. “I think we have a very fair agreement between our county attorney and the Board of County Commissioners for today and for the future,” Hines pointed out. Elbrecht signed the agreement on Feb. 20, the document shows. “It’s fair to us; we have control,” Detert responded, referring to the language regarding a termination vote. “I look forward to working alongside you,” Ziegler told Elbrecht, who was in the audience in the Commission Chambers at the County Administration Center in downtown Sarasota. In seconding the motion, Commissioner Michael Moran noted that Hines’ efforts had made the approval of the new county attorney’s contract an easy decision for the rest of the board members. After the vote, Hines asked Elbrecht if he would like to offer any remarks. Stepping to the podium, Elbrecht thanked the commissioners for the opportunity to serve as county attorney. “It’s an honor,” he said. “I’m very excited about this job,” Elbrecht said. Elbrecht’s biography on the county website says he joined the Office of the County Attorney in June 2005. It notes that he graduated with honors from the University of South Florida in 1977, and he earned his law degree in 1980 from the University of Florida. Elbrecht has been board-certified in civil trial law since 1993, the website says. Additionally, he “has achieved the AV Preeminent Rating from Martindale Hubbell,” the website points out. “An elite group of approximately 10 percent of all attorneys holds an AV Preeminent Rating, a designation trusted worldwide by buyers and referrers of legal services,” the website says. “He practices in the areas of civil rights, commercial litigation, and general government law,” the county website adds.